This is the young lady now, she has a lovely smile and perfect teeth. She was delighted with the end result. ‘These teeth are lovely, I am really pleased' was her comment. 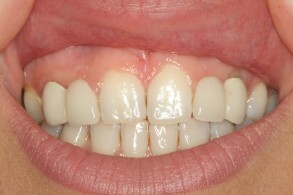 With this patient we constructed 2 x 3 unit bonded bridges at UR123 & UL123 with porcelain butts, and used the GC initial porcelain. We did shade matching at our lab and a patient consultation was essential. 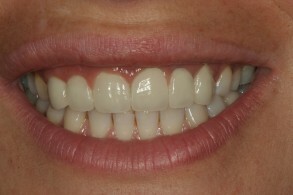 This benefited both patient and technician in finding the perfect end result.